A natural tooth should be saved first, and a dental implant should be the last option. A case of bad implant placement (which was done elsewhere) is shown in Fig. 1. 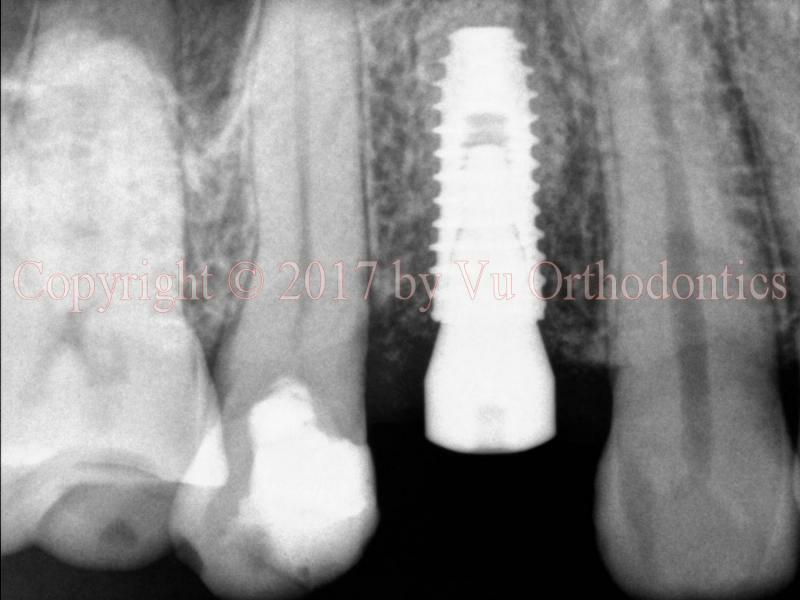 In this case, the implant was placed not parallel to the adjacent roots﻿. Its axis should be along the yellow line -- not the red one. It was also placed too deep. More importantly, the implant is of the wrong type. It is a tissue-level implant (of Straumann), so the top part of the implant should be above the bone level -- should not be below the bone level, as shown. Fig. 1. 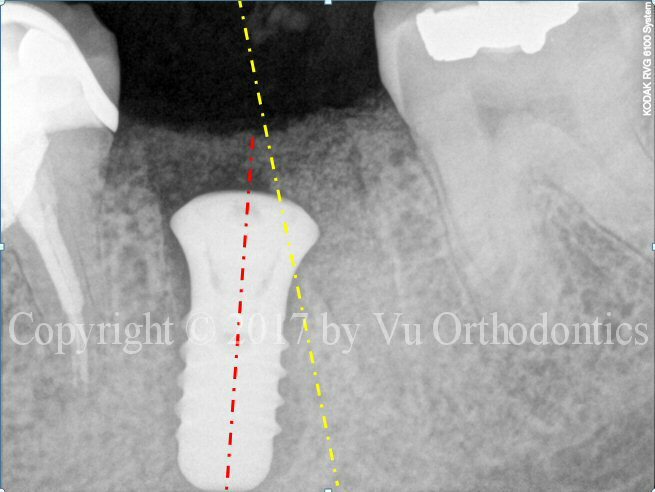 Bad implant placement: the axis is supposed to follow the yellow line, not the red one. 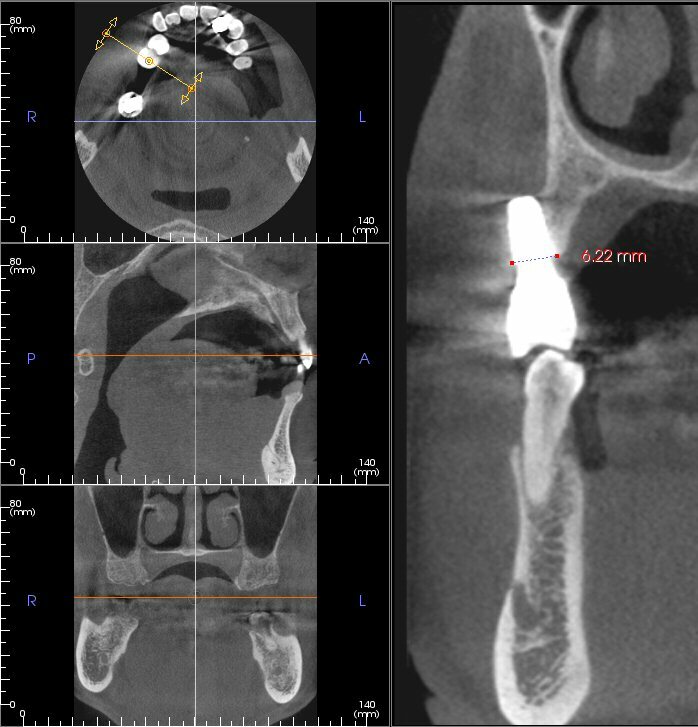 Another case of poor implant placement (which was done elsewhere)﻿ is shown in Fig. 2. 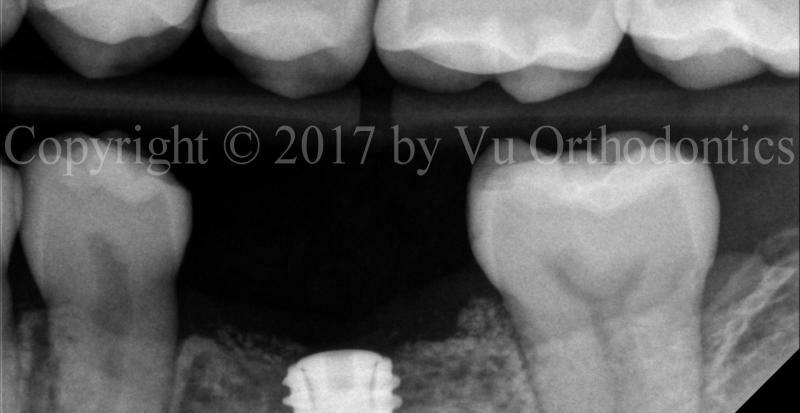 In this case, the implant (in the middle) caused a damage to the adjacent natural tooth. Another case of bad implant placement (which was done elsewhere)﻿ is shown in Fig. 3 (photo)﻿ and Fig. 4 (cross-sections of the CBCT scan). In this case, the implant is almost completely out of the bone. 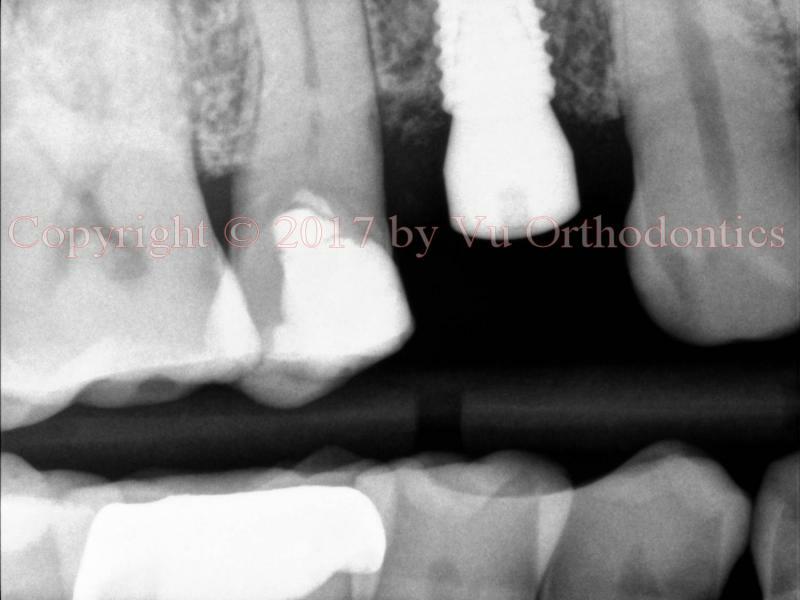 The site is of the upper right second premolar (Tooth #4). 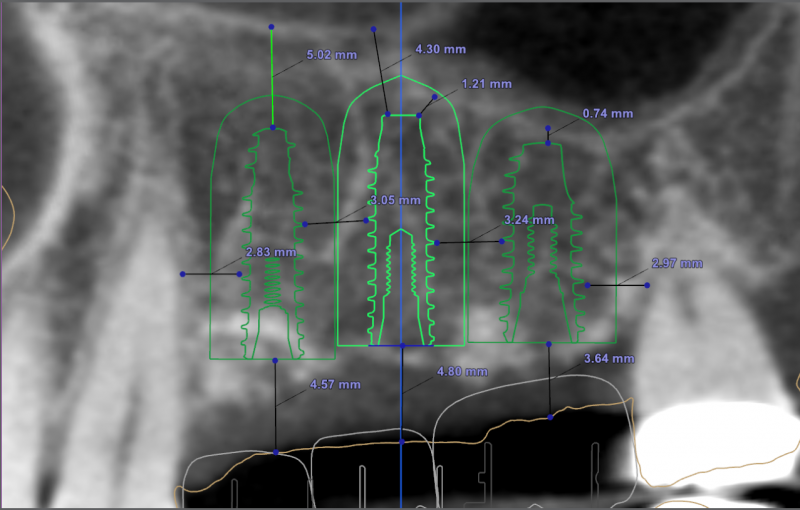 Even if the dentist had placed the implant in a perfect position and orientation, the bone width (in buccal-palatal direction) would still have been too small for this implant (6.22 mm, measured at the implant-platform level). According to the patient, the dentist who placed three (3) implants on him. But two (2) fell out, and only one remains. The dentist took some radiograph(s), presumably, PA or BW or both, and then told the patient, "The bone looks good." 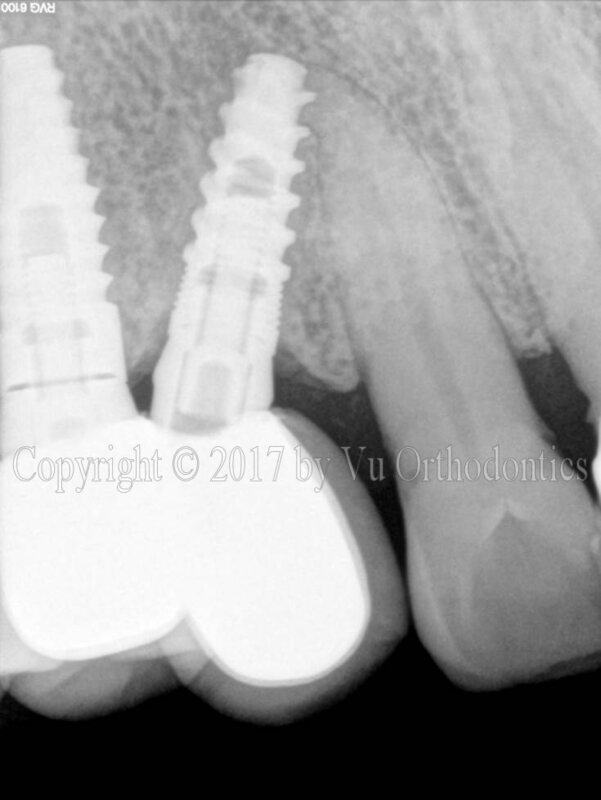 In this case of single implant, a fully guided system is used. The implant is perfectly placed center, between the roots of the two natural teeth. 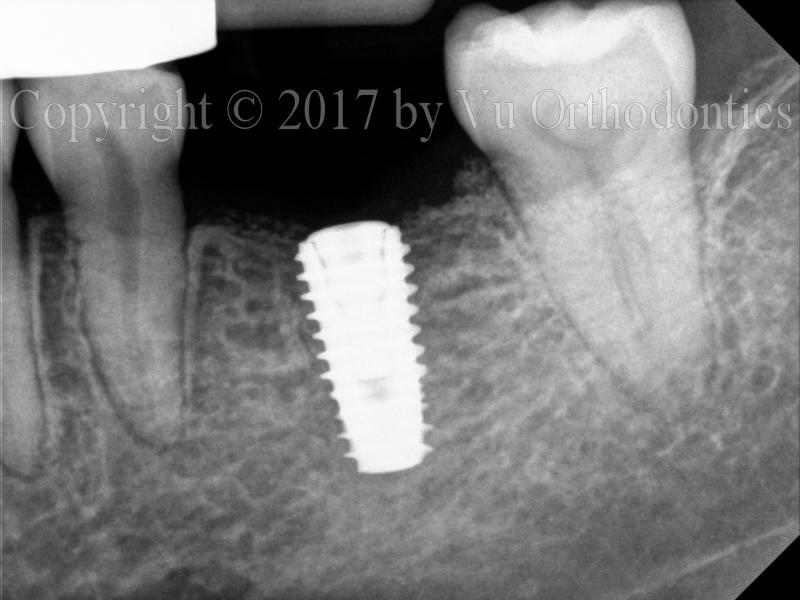 And the implant platform is about 0.5-1 mm apical from the bone level. Another example shows a good implant placement (which was done by the author, Fig. 6), using a fully guided system.